8 Aug 2018 9pm UTC – Text by Paola Catapano. Safiria and Mathilde deploy the mantanet. What a day! It seems as though a few days have been compressed into the last 14 hrs. We cast off this morning from beautiful Lilliehöökfjord, where we had anchored with nobody around. 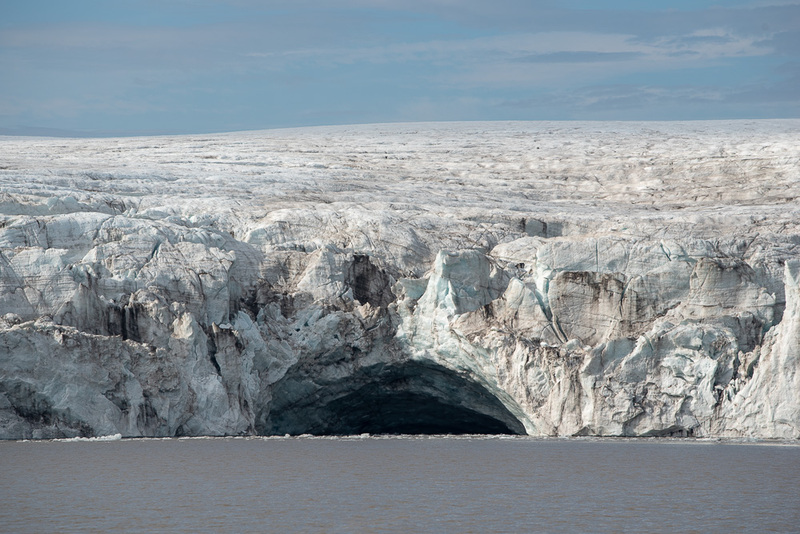 We left in the full sun, and the shining beauty of the glacier all around us… except for a huge ship, the World Cruiser, blocking our way out of the fjord and surrounded by a swarm of kajaks and zodiacs. This is the kind of tourism you do not want in such an unspoilt and critical area of our planet. Peter and I are so disgusted that we spontaneously make a joint resolution: our objective after this expedition is to launch an initiative to protect the ice pack (banquise) with appropriate legislation, forbidding tourists on certain sites and allowing just 1/1000th people per inhabitants. A new movement was born today on board Nanuq! Today we started shifts again on board Nanuq and mine is starting now, in full sun and calm sea, without wind! All I have to do for the next 2 hours is watch the course and avoid us crashing against ice blocks. 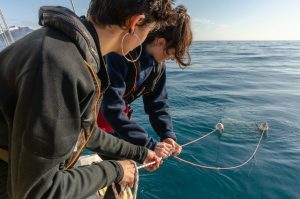 At the end of my shift Safiria and Mathilde deployed the Mantanet together, taking advantage of the ideal conditions. The girls together are perfectly at ease with the procedure. Safiria noticed a change in the filter compared to earlier samplings: more algae is here above 79 N compared to more phytoplankton at lower latitudes. And so we got to the most photographed site of Svalbard: Magdalenefjord, a place of rare beauty. With alpine glaciers sliding into the sea, an enchanting view from Nanuq sweetly sliding over ice blocks of all shapes. Some of us see whale tails, others the face of a bear or even penguin shapes floating in the deep blue sea. All of a sudden, the heads of two seals pop up from the water! They also attract our attention to the mighty profile of… a grey warship. Military activities are forbidden on the islands. This ship, though it had the name Kystvakt (coast guard), it was equipped like a warship, even a cannon just below the cockpit. In a matter of seconds we realise they’re there to protect the Royals who seem to follow in our same track! 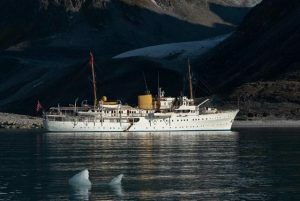 Here’s the beautiful profile of the white royal yacht again, shining against the white background of the most iconic glacier of Svalbard! Nanuq quietly slid past them over the brittling ice in the eternal sunshine of the polar summer. A few miles and two great meals later we anchor in another unmissable milestone of our trip: Virgohamna, the Virgo Bay, with Danskoya and Amsterdamøya, where two of the very first polar expeditions of history started off: one by hot air balloon, the other by airship. Neither swedish-man S. A. Andrée nor american Walter Wellman succeeded… the remains of the hangar where Andrée’s balloon was inflated and the hydrogen was made are still there but unfortunately visits on land are forbidden due to the unsustainable behaviour of cruise tourism. Look forward to another update tomorrow!